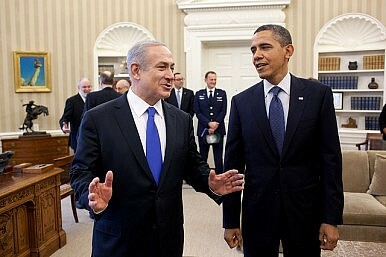 Israel’s concerns about a deal between the US and Iran are understandable but misguided. Israeli Prime Minister Benjamin Netanyahu has once again threatened to unilaterally attack Iran to thwart its nuclear program. But it also reflects Israel’s deep-seated fear that the U.S. will cut a deal with Iran to the detriment of Israel’s interests. This concern, while understandable, is misguided as Israel stands to be a primary benefactor of any U.S.-Iranian rapprochement. This is evident from looking at Israel’s primary interests as they concern Iran. The first among these is preventing an Iranian nuclear weapon. Any deal between the U.S. and Iran would certainly allow Tehran to retain some enrichment capability. Nonetheless, Iran enriching uranium to low-levels under strident international safeguards is considerable better than the current situation. Furthermore, with notable exceptions like France and Israel itself, the U.S. has a solid track record of restraining allies’ nuclear weapons ambitions. By contrast, America’s fiercest adversaries like the Soviet Union and Maoist China have often been the very powers that have acquired nuclear arms. Countless others, like Saddam Hussein and Mohammad Gaddafi, failed only due to their own incompetence. By all accounts, Iran’s nuclear competency is not an issue. Additionally, a U.S.-Iran rapprochement would significantly weaken Iran’s incentives to acquire a nuclear weapon. While there’s some debate, most agree that security and prestige considerations are the primary motivations Iran has for building a nuclear bomb. Since the U.S. toppled Saddam Hussein in 2003, Iranian leaders have seen America’s unmatched military power and stated hostility towards their government as their biggest security threat. A U.S.-Iranian rapprochement would therefore remove a core rationale for Iran to build the bomb. Another key motivation for Iran’s nuclear program is prestige. Iran is an ancient civilization and a relatively advanced modern society. It therefore resents Washington’s efforts to isolate it internationally and compare it to countries like North Korea. Indeed, Iranian leaders go to great lengths to counter this narrative through speeches, state-run media, and diplomatic initiatives like hosting the non-alignment movement’s summit last summer. Iranian leaders have also cast their nuclear program as a powerful symbol of Iran’s modernity and ability to prosper despite foreign hostility. But by welcoming Iran back into the international community, Iranian leaders would have far more avenues by which to fulfill the Iranian people’s nationalist aspirations, allowing them to scale back the nuclear program. Another Israeli concern is that a rapprochement with Iran would result in Washington abandoning Israel in its larger geopolitical struggle with Iran. This fear is also understandable but misguided. To begin with, the U.S. has a vested interest in preventing any nation, friend or foe, from gaining an undue amount of influence over the Middle East. More importantly, Israel is a powerful democratic country which the U.S. has compelling strategic and moral interests in retaining as a close ally. Furthermore, the U.S. has an unparalleled record of maintaining its commitments to its allies, from its continued military presence in Europe and Asia, to its timely assistance to Israel and Saudi Arabia at critical moments. America’s commitment to Taiwan has endured substantial ties to China. There is therefore no reason to think Israel wouldn’t continue to receive priority from Washington. Finally, a U.S.-Iran rapprochement would drastically reduce Iran’s support for proxies against Israel, so long as Israel exercises similar restraint. The Iranian government’s ideological leanings and desire for a regional leadership role make an Iranian-Israeli rapprochement untenable at this time. Even quiet cooperation like that which occurred between Israel and the Shah is likely to prove elusive at this time. Nonetheless, Iran understands the U.S. couldn’t stand idle as Iran backs Hezbollah and Hamas’s attacks on Israel. In fact, a key component of Iran’s grand bargain proposal to the U.S. in 2003 was its pledge to restrain these groups. Given Hezbollah’s pressing need to concentrate on domestic priorities, it’s unlikely to put up much resistance. In short, there are formidable obstacles to ending any rivalry as long-standing and bitter as the U.S.-Iranian one. Israel should be dedicated to helping them overcome these. An Act of Self-Preservation: Why Iran Wants the Bomb"Red Lines" On Iran: Not So Black and WhiteNearing A Fait AccompliIran Nuclear Talks Are WorkingIs U.S. in Iran Cyber War?